Homeowners who have small children or grandchildren in their family often include a children’s playground in their landscape design. These outdoor play areas encourage kids to spend time outdoors, to engage in physical play and to make staying active part of their daily lives as they grow up. Once we hit adulthood and our schedules begin to fill up with work, family and social obligations, many of us no longer have time to spend hours playing outdoors, and most of our physical activity takes place in crowded, stuffy indoor gyms surrounded by strangers. Lucky homeowners with a spare room that is not needed for other purposes might be fortunate enough to have a gym – or at least a treadmill – at home for workouts that are a bit more private, but there is nothing quite like getting outside in the fresh air and sunshine to more fully enjoy your fitness routine and improve your mood. Those of us who are lucky enough to live in Southern California get to enjoy some pretty great weather all year long, which means it is usually not the elements keeping us indoors for our workouts. While hiking, biking, rock climbing, skiing and all of the other outdoor activities we can partake in are readily available to most people in San Diego County, Orange County, Riverside County and the surrounding areas, it can be difficult to set aside enough time in our busy days to actually make it out to do these things. Plus, once we get home from a long day at work or finally get to sleep in on the weekend, our best exercise intentions can easily go right out the window – particularly when it involves dressing appropriately for going out in public and having to leave the house when all we want to do is collapse on the couch. However, if we have at least a few key pieces of gym equipment at home, we can work out at whichever hour of the day or night works best for us, wear whatever we want for our workout and avoid paying for a gym membership. Working out at home also allows us to more easily multitask as we cook dinner, keep an eye on the kids or get in a quick conference call while burning calories. An indoor, at-home gym can be a great thing, but not everyone has a spare room that isn’t needed as a guest bedroom, office or other functional space. Plus, even if you have the room available inside your home, moving your gym outside frees up that space so that it can be used for other purposes, such as an art studio, play room or man cave. And you get the added benefit of fresh air and a natural setting that is sure to boost your mood and be far more motivating than staring at a wall while working out. If you have the room, a tennis, volleyball or basketball court would be a great way to create a space where adults can play outdoors, but most homeowners do not have enough extra room in their backyards to incorporate an activity area of this size into their landscape design. It is usually more feasible for homeowners to use part of a patio, gazebo or other existing outdoor space to create a backyard gym that fits their needs. The first decision you need to make when designing an outdoor gym is whether you want to use a covered space or an uncovered space for your workouts. If you have an existing space on a covered patio that will fit your equipment, that is usually the best option and will offer the most functionality. When you choose a covered workout area, whether on a patio, in a gazebo or in an outbuilding, your equipment will have more protection from the elements, you will be able to work out even if it is raining and you are more likely to be able to leave your equipment set up for impromptu workouts. If your patio has a pergola, this will provide some protection from the sun while you are working out, but it will not provide enough cover for your equipment to avoid rain, rust and dirt. A shade structure is another option, which can be portable or permanent, and is an inexpensive way to create a covered area for your outdoor gym. Uncovered areas can also work out quite well; however, you will likely want to invest in covers for your equipment to protect them from the sun and rain and to keep them clean between workouts. If you are more interested in partaking in yoga on the grass or using a pilates machine that easily folds and stows away when not in use, you may not need a cover for your workout area at all. This is, of course, the less expensive option, particularly if you do not currently have a covered space to use. You may also want to keep in mind that a covered area provides a bit more privacy if you are not so keen on working out in front of your neighbors. The second decision you need to make is whether you want to install permanent, stationary gym equipment, or portable pieces that you can put away when not in use or move around at will. This will mostly depend on the type of workout space that will best fit your needs. Do you just want an open space where you can do yoga, tai chi, pilates, stretching or step aerobics outside? Do you want to lift weights or focus on resistance training to build and tone muscle? Do you want to burn some serious calories on larger gym equipment, such as a treadmill, elliptical trainer or rowing machine? 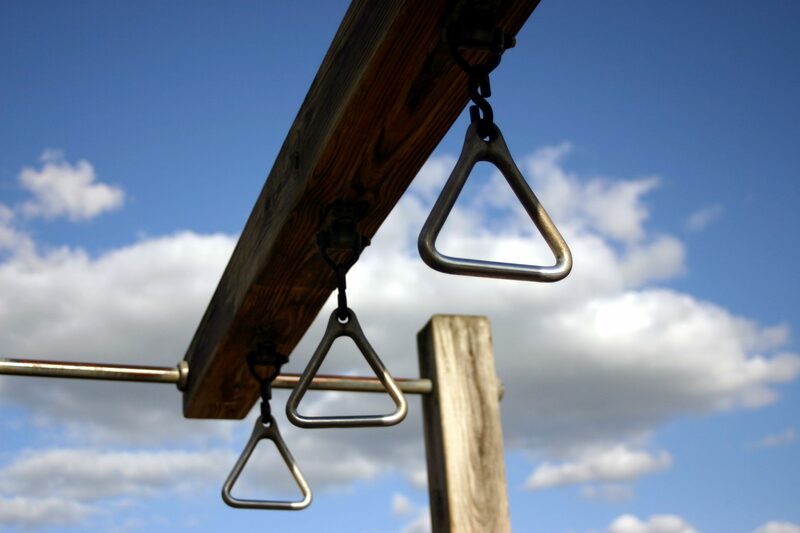 There are lots of options when it comes to choosing equipment for your outdoor gym, including equipment that is specifically made for outdoor workouts – like the fitness equipment you see at parks that have open-air, community gym areas. Looking much like a playground for adults, these well-made, permanent pieces can be installed in your backyard for both you and your kids to enjoy. For example, stationary exercise bars, pull up bars, balance beams or climbing domes can be used as workout equipment by the adults in your family and as playground equipment by the children. As an added benefit, children who see adults staying active on the same equipment they use to play will be encouraged to stay more physically active in their youth and as they grow up. If you plan on using an uncovered space and want permanent workout gear, you may also want to look into step climbers, exercise bikes or ski machines that are specifically designed to be installed outdoors and to withstand the elements. If you are using a covered area with electrical outlets nearby, you can also simply put your indoor treadmill or stair climbing machine outside on your patio for outdoor workouts. If the area is protected from the elements and theft is not an issue, you can permanently place your equipment on your porch or patio so that it will be ready to use whenever you have a chance to get in a quick workout. Alternatively, if you are using an uncovered area or have a small backyard, you might find that using portable options that can be stored when not in use might be a better option for you. This might include free weights, folding exercise machines, yoga mats or resistance bands. Using smaller, portable equipment options can give you more opportunities to switch up your exercise routine and stave off boredom. For example, you can make some of your own equipment or use items you may already have around the house to expand your exercise options, such as tires, ropes, sand bags, buckets or plastic cones. In this case, you simply need a shed, outdoor closet or trunk to store your equipment and keep your yard and patio looking tidy when you are not using it as an outdoor gym. For the safety and comfort of exercisers, indoor gym floors are often covered by mats that are slip resistant. When creating an outdoor gym where the floor may become wet from rain or your irrigation system, it is even more important to have a non-slip surface. Therefore, if you plan to install your gym on a patio, the best hardscape option for this is paving stones. Paving stones are slip-resistant and provide a solid, level surface for safer exercising. They also are an easy way to beautify your backyard and can increase the value of your home, which makes them an easy choice for any landscaping project, particularly outdoor gyms. If you are installing a permanent backyard gym in an area that does not currently have a patio or ground cover, you could also consider rubber playground surfaces, such as mats or mulch, that provide a nice cushion around exercise equipment. Wood decks, particularly when installed adjacent to a paving stone patio, make elegant, beautiful workout areas for yoga, tai chi or Qigong. These activities, and other workouts that use equipment that can be stored when not in use, can also simply take place on your lawn. However, if you have a natural grass lawn, there are a few things you will need to consider before making this your workout area. Natural grass often has clumps, small holes or other tripping hazards that can prove troublesome when trying to use the area for exercising. After rain or watering your yard, mud can also be an issue with a conventional lawn, and the soil beneath grass can be filled with bacteria, particularly if you have pets that relieve themselves in your backyard. Artificial grass makes a much better ground cover for a workout area and provides a level, stable surface to reduce the risk of tripping. With a synthetic turf lawn, you also do not have to worry about mud, and it can be easily rinsed off with a hose after pets use it as a bathroom. Additionally, if you happen to leave your equipment out between workouts, you do not have to worry about killing a section of your grass or your workout gear getting wet from your sprinklers. Once you have found a space for your backyard gym, decided which types of equipment to include, chosen a ground cover and determined whether or not your gym will have a roof, there are just a few more things you might want to consider. Privacy is one thing that might become an issue if you are a shy exerciser or have nosy neighbors. You might want to increase the privacy of your yard by adding reed fencing, installing a trellis or putting in a privacy screen. If you plan on working out early in the morning or late at night, you will also need to make sure you have adequate lighting available. If you have enough space, you might want to consider including some larger activity spaces in your landscape design, such as a backyard climbing wall, a walking track, a basketball hoop with a half court or another personal favorite that will help you take your workout outside. 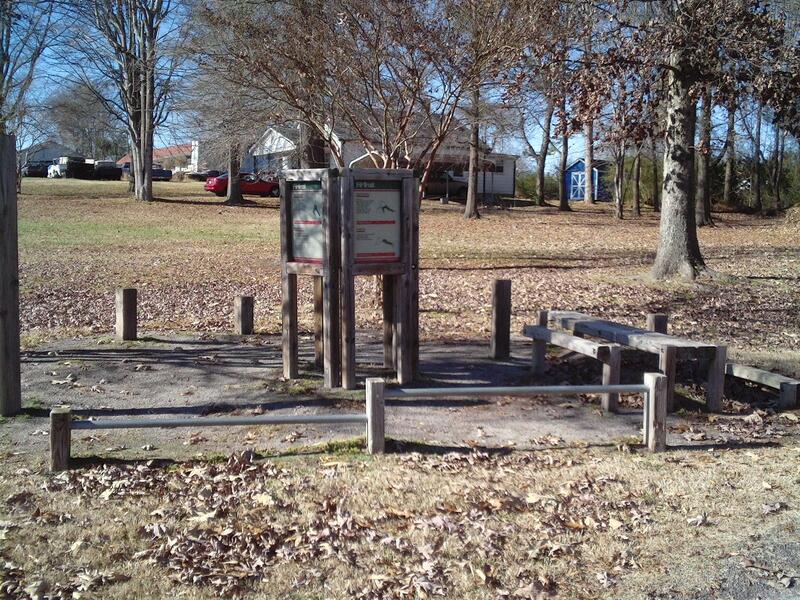 Do you have an outdoor workout space? We would love to hear how you incorporated a backyard gym into your landscape design.